What?! a no heat iron! Crazy cool. I’ve only seen this product being used, never myself, but thought the no-heat element was so cool that I wanted to share it with you! The HAIRBEAURON technology rebalances the entire hair structure and function, from the follicle through the hair shaft. 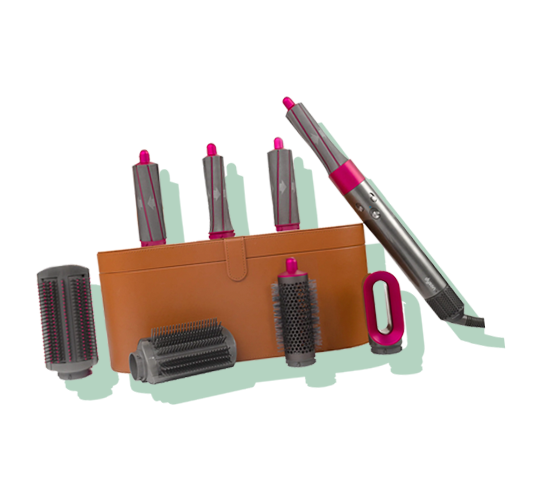 It’s Designed for all hair types and textures - even those who have stopped using flat irons because of processed, damaged hair. Their website says that You’ll see steam from your hair during use but that it’s not smoke, and is actually the HAIRBEAURON increasing moisture, not burning. Is this a texture product, or a gloss? it’s literally both! I’m loving this product because you can add a bit of texture to the hair and some mega shine at the same time. Overall this is a really innovative product, but it’s a bit tacky so don’t overuse. Good for all types of hair texture, including: Straight, Wavy, Curly and Coiled. I’ve featured dyson before for there styling products. I love companies that are always pushing themselves, and they’ve created a really innovative way to curl your hair with the Airwrap styler. I really Love it for lazy hair days! The styler doesn’t cause the damage you see from extreme heat because it wraps the hair and only uses air to dry and style at the same time. There are different styler sets you can get depending on your hair type that come with tools that smooth and create different levels of volume, style and curl. Be sure to check out the full line up and more details here for the different ranges. wowza, someone finally came out with a leave-in conditioner that has what it takes to go up against the number one leave in, “its a ten”. the true test is when I put it in magnolia’s hair and her tangles came out in minutes. Its a must for sure. The Magic Myst elixir was designed for all hair types and Formulated to enhance, strengthen and transform hair as soon as the first use. Magic Myst reinforces, strengthens and seals the cuticle to dramatically repair damage while detangling and protecting against daily heat styling.